Trees and Large Objects can now render instanced indirect with shadow visibility testing. Upgraded terrain APIs. for 2018.3+ TerrainLayers are now used. Added a mode to render all shadows in shadow culling. Added a Vegetation Type selector to the vegetation item list. Include/exclude texture rules now support 32 texures on the terrain. Added option on MapMagic component to add vegetation system based on names of child object of the generated terrain. Fix for vegetation items in the persistent storage not masked by vegetation masks if UseVegetationMask was enabled. Fix for potential error when painting manuallaly and one or more terrains was not started. Fix for artifact in top of billboards. Needs billboard regeneration. Fix for instanced indirect rendered objects getting bad lighting with lightprobes in scenes. Advanced mode setting for allowing more than 64 vegetation items. This will be set as default in a future update. Added static SetWaterLevel function on the VegetationStudioManager. LODs are now recognized with both upper and lowecase naming. LOD0, lod0 etc. SceneVegetationImporter does now check if the prefab already is added to the vegetation package and uses that. TerrainTreeImporter does now check if the prefab already is added to the vegetation package and uses that. Autoselect terrain will now prioritize terrain components in parent Transforms. Added tool window for setting up Vegetation Systems on multiple terrains. Vegetation Studio will now randomize the random seed after it generates the values needed. Fix for compute shader error that could happen on 2018.1+ Compiler gave an error if a cell had an empty compute buffer. Fix for issue with some blinking at billboard transition. Fix for frustum culling issue that could happen with multiple vegetation systems with different camera view. Added fix for global density changes not saving. Trees and objects can now be painted on the peristent storage. Max radius on painting tool increased. Added a Gaia extention to easy add Vegetation Studio to scenes with Gaia terrain. Vegetation Masks now have an optional Ground Layer for snapping to terrain. This is for future mesh terrain use. Fixed error when trying to paint with an empty vegetation package. Fix for computeshader link error on OpenGL on Windows. Added fix for curve labels in wrong color on light skin. Fixed error that could happen in 2018.1 with Speedtree lodfade and invisible trees casting shadow. Added API to get instances of a vegetationItem to VegetationStudioManager. ShadowMaskCreator can now handle “unlimited” number of vegetation item instances when generating the shadow mask. Added Amplify node for Touch React system, for 3rd party grass shaders. Added RefreshVegetationModelInfoMaterials to the VegetationStudioManager. Grass, plants and objects with multiple submeshes can now render instanced indirect. Added some API changes for integration with MapMagic. Added some additional Vegegetation Mask line options for EasyRoad3D integration. Changed Additional mesh max distance from 700 to 1000 meter. Small render loop optimization on computeshaders. PersistentVegetationStorage package can now be set to auto init. Fixed small issue with normals on billboards. needs regeneration. Fix for compile error on TerrainHeatMap.shader on vulcan. Setting for enabling manual vegetation refresh on the vegetation tab. Runtime prefab spawner can spawn on grass and plants, also when instanced indirect. Vegetation Items in the persistent storage can not be affected by VegetationMasks. Setting on each item. Removed “clone” from the name of objects spawned with the RuntimePrefabSpawner. Windsamplers are now activated for terrains out of range. Added custom WindSampler material for Speedtree wind. Will allow dynamic bathing on this. Fixed autodetection bug for sunlight. Fixed compile issue for windows store on CTI billboard shaders. Fixed colorMask sRGB setting in linear mode. Fixed compute shader errors on Unity 2018.1 Beta. Now removing NavMeshObtacles from the WindSampler object if on the original prefab. Fix for some tree creator trees missing leaves in the standalone builds. Fix for billboard atlas generated that was effected by scene fog. Fixed billboards not showing at one angle. Regenerate billboards needed. Changes to Billboard system for better support of CTI shaders. BakeVegetationItem function on PersistentStorage is now enabled for use in builds. The Storage will not save between sessions. Fix for error when detecting shader and no mesh object was detected. Fix for heightmapUtil dll error on Mac with target set to windows. Unity requested some small changes. We decided to include the first planned update when resubmitting. Added ShadowMapCreator Component. Makes shadow masks for Microsplat. Billboard Atlas packed better, giving 4x the pixels per image and lower pixel discard rate while rendering. Added new highsample modes for 2D and 3D billboards. 16 samples in each direction. Injecting CTI shader wind automatic. Fix for tree billboards not following rotationOffset setting. Fixed UI splash screens in wrong color mode in linear. Fix for terrain updating splatmap when Apply on editor changes was disabled. New vegetation items are selected automatic. Fixed bug where a random GUID was returned when asking a vegetationPackage if a prefab exists from before. All components now have documentation direct links from the upper right corner help icon on the components. Added additional testing to reduce work in update function for terrains out of distance. Added setting to use CPU frustum culling and individual LODs on Objects and LargeObjects. Enable instancing will only be set to enabled if it is disabled. Was triggering file change for source control. Removed error that could happen in editor mode with no sceneview visible. Changed some UI textures to transparent versions. Fix for render loop issue when material was missing. Replaced some occurances of touch bend in inspectors. Touch react now. All components help icon now linked to documentation pages on the website. Trees are now culled by camera frustum. Potential shadowcasters outside are rendered as shadows only. Enabled per item LODs on objects and Large objects. Shadow culling on Large object shadows. This allows for proper exclusion of non visible trees and less load on the GPU. Changed Vegetation Item drop zones UI. they allow for mulit selection drag and drop now. Touch Bend system renamed to TouchReact system. This might require adding TouchReact and Mesh components to objects again. Compute shader renderloop is set as default to disabled. It can be enabled on the Render tab. 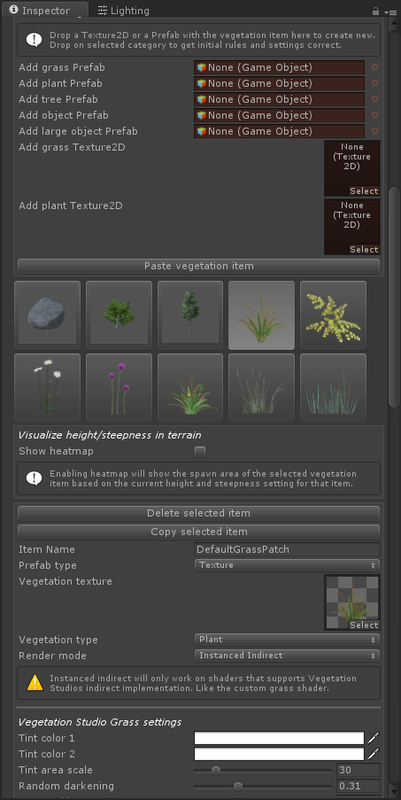 Scene Vegetation Baker can now export grass and plants also. Scene Vegetation Baker has setting for static export. GC cleanup in render loop. SunDirectionalLight is set at Reset() event. Added setting to load terrain detail mask to memory. Default setting is false. Added an extra float4 as control data to the structured buffer passed to the indirect shaders. for future use. Removed VR related compile error. Fixed potential error in MeshUtils when calculating the bounds of a prefab. New compute shader based renderloop. Instanced Indirect (grass, plants, flowers) render lists are now produced on the GPU, culled for frustum and vegetation distance and split in LODs for rendering direct from a compute buffer. Individual LOD control per vegetation items for instanced indirect shaders. Added settings for GPU Culling, Use Compute shaders and use Indirect LODs on render tab. Added support for generating NavMeshObstacles on Colliders. Redesign of some UI on vegetation system component. Added setting to Enable/disable GPU frustum culling on instanced indirect grass. GPU Culling is now disabled by default in VR due to multiple camera frustums. Fixed vegetation not sampling correct close to the cell borders. Fix for issue when multiple vegetation systems with the same vegetation package did not refresh on multiple terrains. Added a 2nd level GPU frustum culling on instanced indirect grass and plants. This is done on top of the internal cell based culling. New component. ObstacleMaskCreator. Use this to create an obstacle mask for the terrain. Spherecasts for obstacles on your selected layers. Baked billboards now have option to save as root gameobjects in the scene. ColliderSystem.BakeNavmeshColliders now returns the GameObject holding all the colliders. Fixed billboard culling bug that could happen on none 0,0,0 terrains. Fixed Billboard system needed to be enabled to bake billboards. Also some bigger changes. The new painting system, baked billboards, floating origin and a rewrite of the RuntimePrefabSpaner GUI. There has been some renaming. DELETE the AwesomeTechnologies folder before importing. Extended RuntimePrefabSpawner component. You can now configure multiple prefabs per Vegetation item. Per item seed and an event for custom spawn logic. Persistent Vegetation Storage painter is now working. New static functions on VegetationStudioManager to refresh VegetationSystem components using a specific terrain as parameter. Baked billboards are now generated in localspace of the terrain. Custom baked billboards shader. Culling distances set in global shader parameters. Blinking in billboards and trees when changing floating origin is removed. Internally cell vegetation are now moved and not re-spawned when terrain origin is moved. Added billboard cutoff to each tree settings, removed from billboardsystem component. TouchBendControler renderTexture is now not serialized with the scene. Billboards internal meshes are now relative to the terrain. Offset is done in the render matrix. This makes floating origin changes “instant” for the billboards. Changes to internal structure for loading trees for the billboard generator. This is now done with the new DirectSpawn functionality of the VegetationCell. This reduces some memory use since the spawned trees for billboards does not end up in the cache. Clear old billboard as option when baking new billboards. Changes to internal message system to refresh billboards. Fix automatic billboard generation issue with missing prefabs. Added HotswapTerrain function on the VegetationSystem component. You can now replace a terrain of the same dimentions without recreating the quadtree and cell structure. Internal data is moved to the new worldlocation. This is usefull in cases where you are reusing vegetationsystem components from a pool with run-time instantiated terrains. All grass and plant materials will have 2 set properties. _CullFarStart and _CullFarDistance These can be used in grass shaders to cull grass at a distance to remove cell popping effect. New component. VegetationColorMaskCreator. this will export a unlit color mask of selected vegetation. Designed for use with terrain shaders to blend in this maske where mesh grass stops. New component. VegetationItemMask. This is designed to mask a single VegetationItem. This could be used for harvesting resources in games. Harvesting demo script added to demo scene. Exposed per Vegetation Item billboard brightness. Added a per vegetation item Disable LOD setting on trees. BillboardSystem.BakeBillboards now have a optional Transform parent parameter to control where to place the billboard meshes in the scene. VegetationItemInstanceInfo component is now added to all run-time object created by the run-time prefab spawner. New internal mask type circleMaskArea. New setting to disable/enable compute shaders. VegetationItem settings to disable shadows. Usefull for underwater plants etc. Added progressbar on billboard atlas generation. Fixes UI bug on Persistent Vegetation Storage that allowed you to try to bake vegetation without a VegetationStoragePackage added. Fixed issue with culling group not destroyed in some cases. You will get a warning about billboards in wrong color space when first using this beta version. It is part of upgrading the package as I do not know what color space you currently has generated for. In the future and on new packages it will only happen when you change color space of the project. Individual LOD selection on trees is now working. Settings is based on LODGroup settings in the prefab. Warning/dialog when using a vegetation package with billboards generated for another color space. Tree LODs are now working as they should. Distances is calculated from the LODGroup and adjusted for QualitySettings.LODBias and an exposed LODFactor setting per VegetatonItem. Make sure your initial LOD setting is set to LOD0 if you want the full quality if the trees. Added option to make colliders triggers. New terrain detail settings importer. This will help you set up VegetationItems for grass and plants used in a unity terrain for run-time spawning. Changes to internal code to bake navmesh. Spawn is now direct to component bypassing cache. UI changes for logo and documentation button. Navmesh build problem. on some cases the entire terrain would not bake. Fixed error that could happen in runtime prefab spawner. Fixed error when adding trees with no materials. Fixed timing issue that could stop vegetation mask from working with terrains loaded run-time. Hi. We jumped to beta 5.0 Some bigger new features in this version. First is the Persistent Vegetation Storage. It allows you to bake the result of the run-time rules to a persistent storage. When baked you can edit tree locations, add and remove instances etc. Loading speed is faster at the cost of some space. But the size is not bad. a 2000×2000 meter terrain with really dense grass took 58mbyte including everything. 1.4 million instances. There is also an API for 3rd party tools to spawn vegetation into this storage and 2 importer modules. 1 that imports terrain trees and the other can import gameobjects from the scene. rocks, trees etc. There is also a painting tool included in the Storage but this is not complete yet. Delete the old folder before upgrading. Some files was deleted, other changed name. Internal refresh changes to GrassPatchGeneratorEditor.cs for wind. Added VegetationSourceID for 3rd party spawners. Some namechanges on the VegetationMask properties. A PersistentVegetationStorage Component is now added when adding VegetationStudio to a new scene using the menu. Some internal ID renaming. All vegetationItems will get a new ID but packages should upgrade. Changed name of a propery on TerrainTextureSettings. Textures used for terrain splat map generation will have to be enabled again. Grass patch generator does now keep plane aspect ratio when adding random scale. Added setting to force disable/enable + GC cleanup when saving the scene. You can turn this on/off in editor tab. Billboards now rotate correct against the Gameview camera in editor mode also. Renamed Grass and Billboard shaders. Materials should auto upgrade. Meta file not changed. Added define VS_USE_HEIGHTMAP_DLL to enable native dll for height map steepness lookup in editor also. Copy paste vegetation item will now copy texture mask rules also. Fixed a bug in the bake billboards function. Added text on run-time prefab spawner. Changed random seed calculation on the RuntimePrefabSpawner. multiple prefabs on the same Vegetation Item now have different random spawn chance. In editor mode billboard generation is now split over multiple frames. Any changes to rules involving billboards will be updated automatc. Added Micro Splat stream control mask. You can now use Wetness, Puddles, Streams and Lava as spawn rules. Added Dropdown String list property type for custom Texture Masks. fixed slow memory copy issue. We removed this beta version due to a memory copy issue that slowed down the render loop. Will be fixed for next version. Multi sceneview support. Culling will be based on the active sceneview. Started using compute shaders for some compute heavy tasks. Minimum shader model 5.0 (was 4.5 before) Reducing spawn time on cells with grass and flowers. Internal changes in cell spawning. Reduced memory use. Optimized visible items render list creation. 0 GC created while updating visible lists. Speed increase also. You can now change the number of textures in a vegetation package. Option on the vegetation package inspector. Added a test to make sure textures are readable before adding to terrain. Fixed some issues with tree creator wind. Now injecting the wind manually in the materials when rendering instanced indirect. Fix for offset issue with terrain texture include/exclude rules. could give an sample error of half the splatmap pixel distance. Changed default alpha cutoff to 0.1 on grass. Gives better grass coverage at distances. Moved calculating the InverseMatrix for grass to the GPU using a compute shader. Removed debug option on VegetationStudioManager to show VegetationMask outlines. Changed fade distance on grass from 10 to 20 meter. New texture mask type. Colormask. It allows you to select a color and tolerance range form a mask texture. Option to get density from alpha or tolerance accuracy. Adding option for masks to store texture in VegetationPackage or on Vegetation system. This is used if you have multiple terrains using the same VegetationPackage and different mask textures. Added WindController component. Used to inject wind data to the VegetationStudio grass if used in a scene with no VegetationSystem. New curve editor that allows for editing height and steepness rules direct in inspector. Added Paste Values option when copying vegetation items. Updated UnityTerrainData.cs You can now disable the c++ dll used for some math in windows standalone mode by defining VS_NO_HEIGHTMAP_DLL as a compiler define. System will fallback to c# version of the same code. 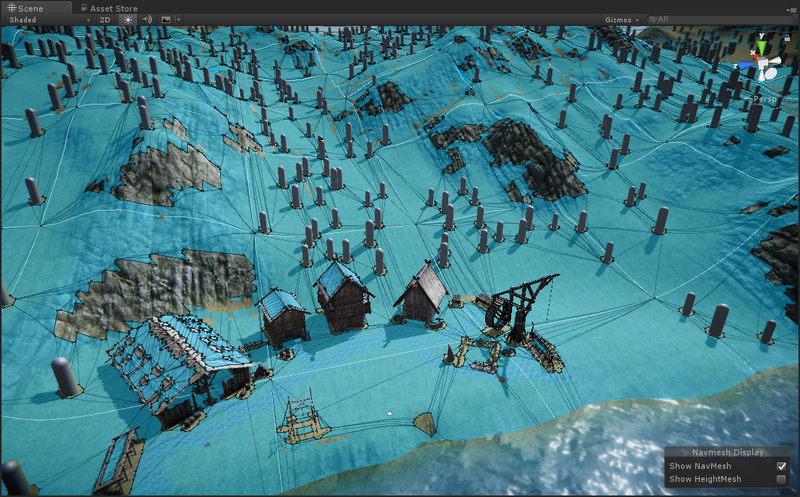 VegetationStudio will now compile on Unity 5.5 releases, there is limited functionality. Instanced Indirect(grass does not work), shaders must manually be enabled for instancing in code. 5.5 Will not be a supported unity version. Changed warning for missing camera. VegetationMasks needs to be enabled to edit. VegetationSystem now starts up in a sleepmode when in editor. Billboards will have to refreshed manually when rules change in editor mode. This is first part of speeding up the refresh when changing rules. Added error message on inspector if developer try to add the base class VegetationMask component. Added settings to compile VegetationStudio into separate binary in in Unity 2017.2 and newer. Will give faster compile time as code is only recompiled when VS code changes. Doing some cleanup before saving scenes. Fixed threading issue that could lead to theads loaded with more work than others. Added static function to Set Vegetation Packages on all vegetation systems. Plants now show up for the run-time spawner if they are not instanced indirect. Offsets on vegetation items, colliders and runtime prefab spawners are now scaled with the item. Finished Mega Splat Control texture mask. Added Texture mask Include and Exclude rules. Fixed compile error when exporting. Fist support for texture masks. Grayscale density mask and perlin mask is ready. Texture Mask Density rule is finished. Removed the need for the EditorCamera in edit mode. Now using the native SceneView Camera for culling. Added MaskBackgroundCreator Component. Add to VegetationSystem Gameobject. Select resolution and generate a ortho image that can be used as background for manual masks. Renamed settings PlantDistance to VegetationDistance. This will reset VegetationDistance on current scenes to default of 100 meters. Fixed density setting mapped to wrong category. Grass patch generator refreshes AssetDatabase. Fixed a possible crash when saving. Added Id field to VegetationMasks. Will automatic set mask textures to readable when adding masks. Added copy paste of vegetation items. Added “external web link” to the documentation button text. Width and height of the grass patch generator is now a range. this can help give different height to each plane. 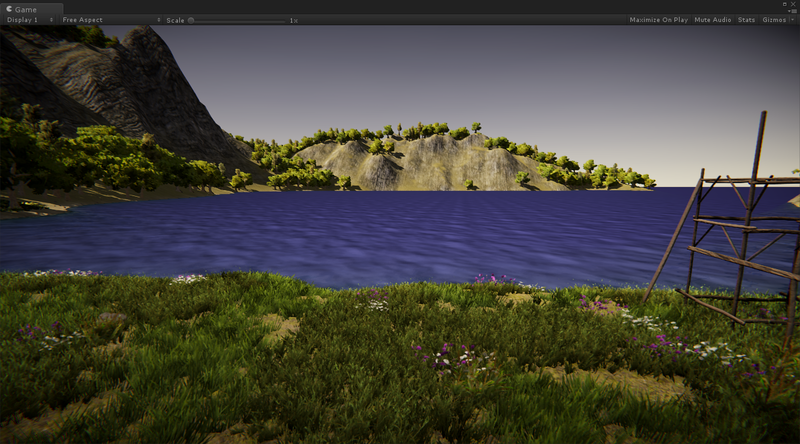 Changed position offset on vegetation items to localspace. Added all 5 categories Density setting. Grass,Plant,Tree, Object and Large Object. Fixed density setting on Localized vegetation on masks. Using prefab and texure name as VegetationItem Name when adding new. Exposed SetDensity static functions on VegetationSystemManager. 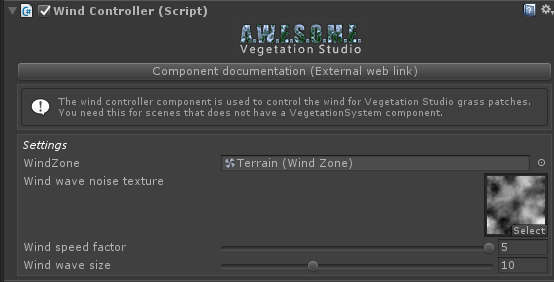 Will set on all VegetationSystem components in scene. Fixed Inspector UI bug on VegetationMaskLine. Will work with only max range set now. Fixed selection of object after adding a new Texture2D vegetation item. There is now a scale setting on box, sphere and capsule TouchBendColliders. Usefull to increase the affected area of ragdoll colliders etc. Added a 2nd level culling on trees. there is no overlap distance between trees and billboards now. Added source LOD for Billboards. Users can decide what Speedtree LOD to use for the billboard generation. billboards not visible is not affected by API respawn. Fixed render bug on billboard Atlas generation. Fixed bug with assigning terrain texture rules on vegetation package with “no textures”. Textures images now direct from terrain in these cases. Added info on terrain textures tab when no textures package is selected. Added HUE and Color tint setting for speedtree, real time updates as you change settings. Added wind effect range to limit wind on grass. Added a regenerate all billboards button on BillboardSystem. Usefull after changing lighing model. Fixed problem with depth buffer on billboards in Forward mode. This fixes problems with Enviro and other fog systems. Removed crash issue with some Editor layouts. Removed disabled dropdown on BillboardSystem component. 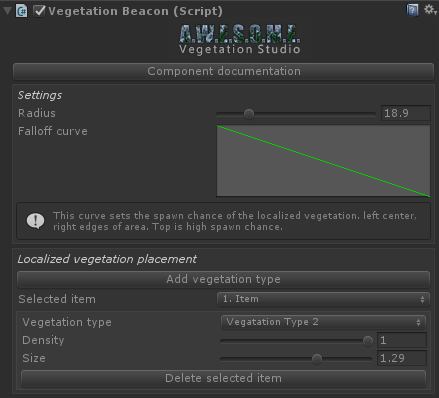 Fixed wrong active Vegetation item after changing VegetationType on an item. Fixed wrong active Vegetation item when adding new. Both a bug from the new sorting of Vegetation items per type. Fixed memory leak that could happen when rendering sceneview in editor mode. Internal work on Texture Mask system. Added support for a range additional distance on Line and Area masks. Area in range is using a perlin noise to create a more organic edge on the mask. New advanced scale mode where you can scale vegetation items in all axis. Lerp between min and max vector3. Fixed issue with some temp gameobjects not clearing when unity recompiles source. Fixed instancing indirect shadow issue on grass. Unity was using a lot of CPU even with grass shadows turned off. Exposed a setting under Render tab to disable InstancedIndirect LODs for grass. Better density in distance at some extra render cost. Fixed VegetationSystem inspector horizontal slider issue. Fixed potential crash when editing colliders. Direct update to colliders in sceneview when editing in VegetationItem inspector. No longer respawns vegetation. Fixed problem with slower framerate in Playmode Gameview if VegetationSystem inspector was active. The lower fps did not show up on Stats window. Fixed potential crash when removing temporaty gameobjects in editor mode. Fixed a instanced material problem that could happen in editor mode with generated grass patches. Added wind support for Tree Creator trees. Added the Runtime Prefab Spawner component. Fixed grass disappearing sometimes in editor mode. Fixed occlusion culling bug removing speedtree wind in some cases. VegetationSystem inspector tabs now remember last selected tab. Fixed issue where vegetation could be spawned on neighbour cell and in some rare cases not be controlled by a vegetation mask. Fixed issue where tall trees on edges of cells could be culled while they still should be visible.